An online petition has been launched in protest at the Gambian president's threat to kill human rights workers. President Yahya Jammeh told state TV earlier this week he would kill anybody who wanted to "destabilise" The Gambia. "If you are affiliated with any human rights group, be rest assure that your security is not guaranteed... we are ready to kill saboteurs," he said. The campaign by a coalition of pressure groups wants the African Union's human rights commission HQ moved from Gambia. Chidi Anselm Odinkalu from the the Open Society Institute, one of the bodies behind the petition, said Mr Jammeh's comments were "beyond the pale". "The people of Gambia have been under siege for the past year or two. We've got an obligation to speak up," he told the BBC's Focus on Africa programme. The headquarters of the African Commission on Human and Peoples' Rights is in the Gambian capital, Banjul. The Open Society, along with the African Court Coalition, is now campaigning to have the offices moved to a different country. Their aim is to secure as many signatures as possible from non-governmental organisations involved in the work of the AU's human rights commission before 28 September, when the petition will be forwarded to the African Union. Their petition quotes Mr Jammeh's speech, which was made before he went to the UN General Assembly in New York. "I will kill anyone who wants to destabilise this country," he said. "If you think that you can collaborate with so-called human rights defenders, and get away with it, you must be living in a dream world. I will kill you, and nothing will come out of it." The petition says Mr Jammeh's declaration "leads us to fear for the safety, security, and lives of ourselves and our colleagues". 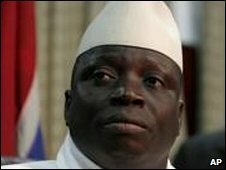 Mr Jammeh came to power in a coup in 1994 and has won three multi-party elections since then. But amid claims of plots to oust him, journalists have been harassed and dozens of people have been arrested and unlawfully detained, human rights groups say.